During my recent trip to New Zealand. I found Indian restaurants' spread all over the town. Me and my husband love to eat at Indian restaurants wherever we go. Needless to say I often end up in Indian restaurant as first choice. I found one panner dish in the restaurant that was amazing- Kadai Paneer. Often at home, I try to cook healthy as much as possible. So at home I make the vegan recipe substituting tofu for paneer. .
You may use chili garlic sauce for more spiciness instead of coriander seeds and red chillis. Freeze tofu over night. When ready to cook thaw tofu and drain excess water. Slice it into cubes set aside. For Paneer slice into cubes.Ready to use cubes are also available in the grocery store. Spray oil of your choice on paneer/tofu. In toaster or oven bake it for 10-15 minutes on 200 degrees. Grind red chilies and coriander seeds into coarse powder. Add garlic and ginger paste, bell peppers, salt, and coarse coriander powder saute it for 3-4 minutes. Add tomato sauce and cook it for few minutes on a low/medium heat. Serve with your favorite roti, rice or pita bread. Curry leaves are among the most widely used spices in Indian food, second only to turmeric. These potent leaves are a good source of Vitamin A, calcium, folic acid, and antioxidants. They have even been used to treat bruises and skin diseases. Ground, raw, or cooked, these leaves make a great addition to a wide variety of recipes. This Thanksgiving I taught my son and daughter-in-law how to make yummy Puff Poori. Karela- Bitter melon is a vegetable one should know for sure. you will love it or hate it. Relationship with this unique vegetable is either or. Karela is widely known in India and China. This is a fruit of a subtropical vine in India, it looks like Zucchini with bumps. It is very bitter in taste and with proper preparation one can love to acquire the taste of it. Most of the time it is thinly sliced and fried with some spices to it. It is amazing to know the fruit contains a polypeptide called gurmarin that suppresses the body's neural response to sweet stimulant. that means after consuming karela sweet buds can be satisfied very easily in one helping of dessert. As i grew up in India, we tend to use each and every part of vegetable. I am sharing a good old recipe which I learnt from my mother. I hope you will enjoy it!! Add salt to peeled skin of the bitter melon. set aside for half an hour. Now add all the spices, wheat flour, besan flour,sugar, lemon juice and one tsp of oil to the peeled skin of bitter melon. Mix well making a dough and later oblong shape called muthia as shown in the picture below. In a medium saucepan pan, heat the oil on a medium high heat. Fry all the muthias slowly stirring upside down. Enjoy it with chutneys or sauces. Tips: Taking the water out of bitter melon peels reduces its bitterness. Always serve warm ,when it is warm it has more flavor and less bitter in taste. This week we’re highlighting three great recipes that all use turmeric. This bold Indian spice adds a great, strong flavor to recipes that make use of it. It’s also got some great health benefits! 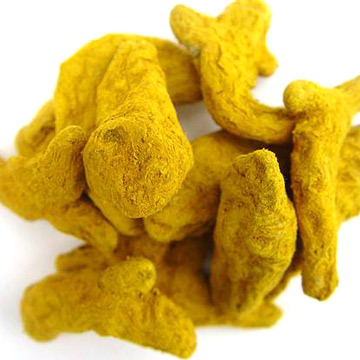 Turmeric promotes good circulation, and helps to prevent blood clots. As a result, it can help to lower the risk for heart attacks. It also helps to keep your bad cholesterol down! If you are left with plenty of raw green tomatoes or If you love green tomatoes!! Here is the recipe with raw green tomatoes. Microwave diced tomatoes in microwave oven for 3-4 minutes. Set aside. In a small saucepan, heat the oil on a medium high heat. Add mustard and sesame seeds. Add jaggery/molasses or brown sugar and stir until sugar turns brown in color. Add salt ,coriander, cumin powder, turmeric, cayenne pepper and tomatoes. Cook for 4-5 minutes till it mixes well. You can note that it will change color to golden yellow.and now its ready to serve. Tomato subji can be stored as pickle for a week in a refrigerator. Also, you can make green tomatoes Enchilada sauce aka Verde sauce. Salsa or fried tomatoes. Enjoy!! Did you know!! green tomatoes are Very low in saturated fat, No cholesterol, High in dietary fiber, High in iron, High in manganese, High in magnesium, High in niacin, Very high in pantothenic acid, High in phosphorus, Very high in potassium, High in thiamin, Very high in vitamin A, High in vitamin B6, Very high in vitamin C.
You probably already have some cinnamon in your spice rack, but you might not realize just how versatile it is. While it’s commonly known for its uses in sweet recipes, cinnamon can also be used in savory recipes to achieve a unique flavor. 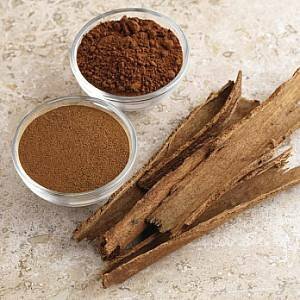 It also has some great health benefits – cinnamon can improve insulin levels, and lower glucose levels. Here’s a great recipe that makes use of cinnamon. This is a great recipe for any season. It is versatile with many fruits. Here, I've used mostly pears, apples and cherries. 1. Combine apples or pears, cherries and lemon juice in a mixing bowl. 2. Set aside so it won't go black. 3. In a different bowl, combine vanilla, brown sugar, cornstarch and cinnamon. 4. Gently mix pears or apples with the cornstarch mixture. 5. Let it sit for an hour or two. 7. For the Topping, combine oats, brown sugar, flour, pecans, cinnamon and nutmeg in a bowl. 9. Mix it well and set aside. 10. After refrigeration, place apple or pear mixture in a small 9 inch baking dish. 11. Garnish with oat topping mixture. 12. Bake at 350 degrees for 30-40 minutes. 13. When it starts to bubble or turn golden brown, it is ready to eat. I enjoy my fruits with dash of sweetness, warm and healthy. Vanilla ice cream is best with the warm fruit. Oberweis Vanilla Ice Cream is my favorite. Here’s a few more great recipes with cinnamon in them. Autumn is here!! I love to see fall colors all over my neighborhood. I love going to farmers market this time of year. I love picking up a basket full of red,green and yellow peppers which which range from hot to very hot to taste.Bell peppers are very versatile and can be used in different ways. Here is a quick very easy recipe. If you want treat for your taste buds with peppers. 1. In a wok add oil on medium heat. 3.Let it sizzle for two minutes ,cover and turn off the heat. Ready to serve with Roti, rice or use it as condiment. Other favourite recipes are Tomato and red bell Pepper soup, Thai curry, and Vegetable lasagna. Red bell pepper has a unique flavor and sweetness. One can use any pepper but the red one has a unique taste to it. Enjoy!! 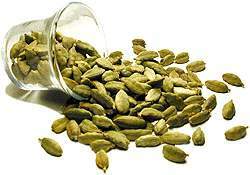 Known as the queen of all spices, cardamom is the dried fruit of a herbaceous plant. It helps with the digestive process, and it can even help to burn body fat more effectively. Oh, and it also adds a great flavor to a wide variety of recipes! Get started cooking with cardamom with this recipe. 1. Grind all the Ingredients in a blender jar and make it a paste. Add in it milk and may be fresh fruit. Blend till smooth. Let it chill in a refrigerator for few hours. Pleasestrain it before drinking ,can be added vanilla ice cream or ice. Check out these other great cardamom recipes!